Tortellini is such a comforting pasta. My favorite tortellini is filled with cheese. Although smothering it with tomato sauce is my usual favorite pasta dish, I also like a pesto based sauce. 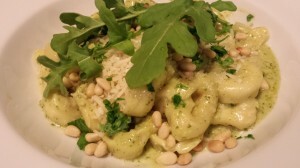 My Creamy Basil Arugula Pesto Tortellini is an elegant dish you can even serve at a dinner party! First of all, make my Basil Arugula Pesto. It’s a simple condiment you can use in pasta sauces or as a spread for a toasty baguette. Then, cook 2 cups of cheese filled tortellini according to the package directions. In a sauce pan, melt some butter and warm some olive oil together. Add some heavy cream and grated parmesan cheese. Reduce the sauce a bit. Add some pesto, and stir. 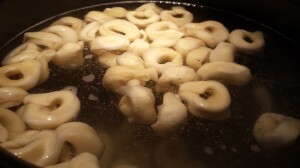 Add the drained cooked tortellini to the sauce, and toss. Divide amongst four plates. 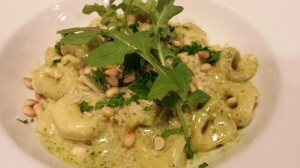 Top with shredded parmesan, toasted pine nuts, chopped fresh basil, and a few arugula leaves. 1. While the water is boiling for your tortellini, make the pesto sauce. 2. In a non-stick sauce pan over medium low heat, melt the butter and heat the oil together. 3. Add the heavy cream and the parmesan cheese and let the sauce cook down and thicken a bit. 4. Cook the tortellini, drain, and set aside. 5. When your tortellini is almost done, add the pesto to the parmesan cream sauce. 6. 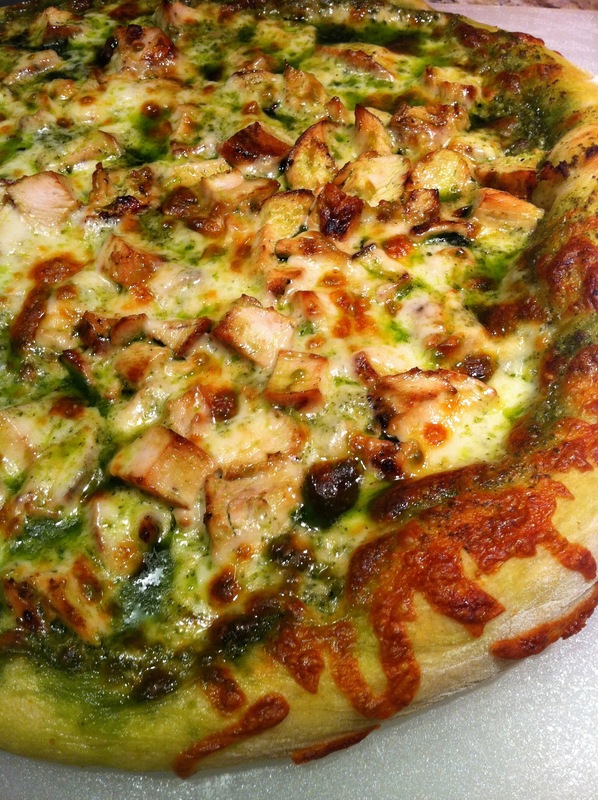 Drain the tortellini and add to the pesto cream sauce. Toss. 7. Divide the sauced tortellini amongst four serving plates. 8. 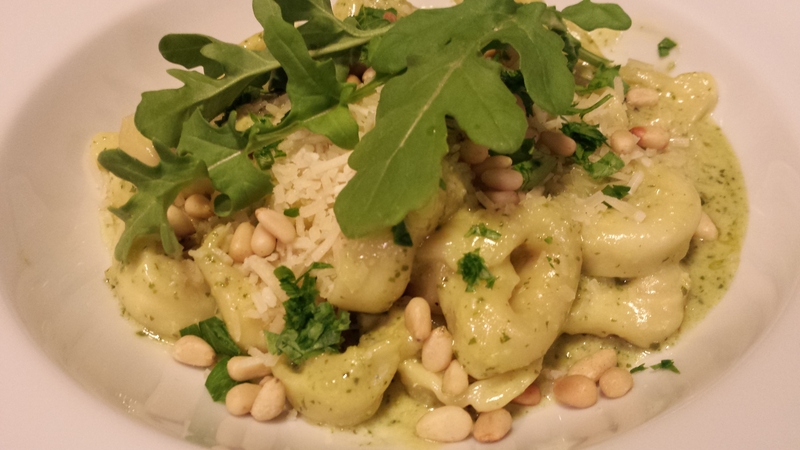 Top with the parmesan cheese, chopped basil, toasted pine nuts. 9. Place three fresh arugula leaves on top of each serving of pasta. Serves 4 for a pasta course. 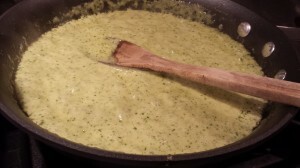 Serve with toasted garlic bread or garlic bread sticks to sop up the sauce. 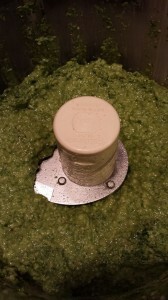 Variations: Use regular basil pesto or another type of pesto instead of my Basil Arugula Pesto. Top with chopped pecans or walnuts instead of toasted pine nuts. To lighten this dish, substitute Greek yogurt for the heavy cream and omit the parmesan cheese and the butter.